Coat, Dorothy Perkins. Jumper, Hobbs. Jeans, NW3. Earrings, Gogo Philip. Ring, Whistles. Bracelet, from Hong Kong. Bag, Bershka. Shoes, Zara. Umbrella, Primark. We’ll touch on the bag later – what makes me really happy about this outfit is the lack of dark shades. 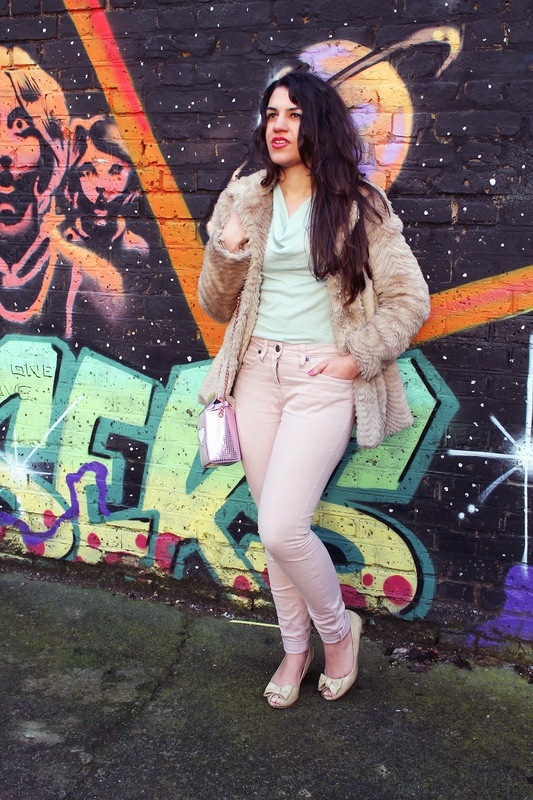 Being able to wear pastels all year around would be a dream come true – every now and again, it does happen. The top was a practical Hobbs sample sale find from 2013, and the pink jeans were part of my spring/summer ’14 work uniform. If someone had told me five years ago that one day I would be wearing baby pink jeans, I would have laughed at them. I have absolutely no idea where I pulled the confidence from to end up doing so, but for some weird reason I liked what I was seeing in the mirror when trying these on over six months ago. I will never feel as confident in jeans or trousers (especially light ones) as I do when I’m wearing dresses, skirts and shorts – but damn, there’s been one hell of an improvement. 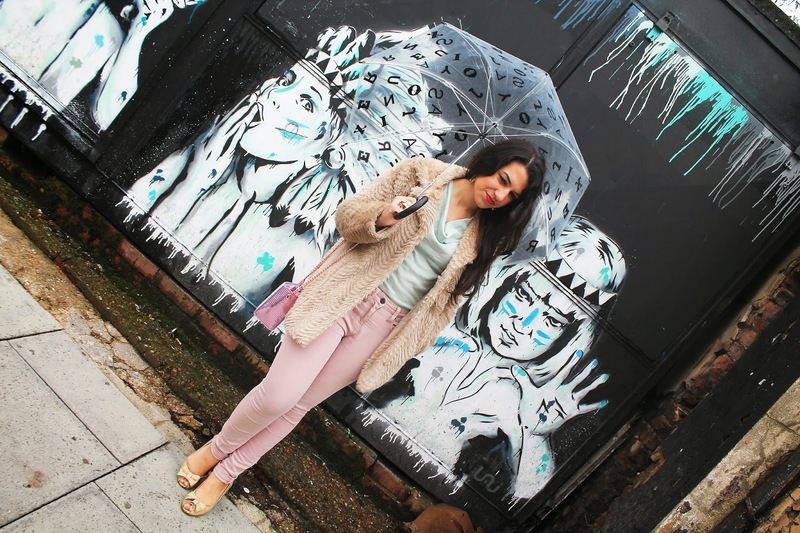 My relationship with trousers has changed drastically over the past two years – will hot pink jeans be the next move? 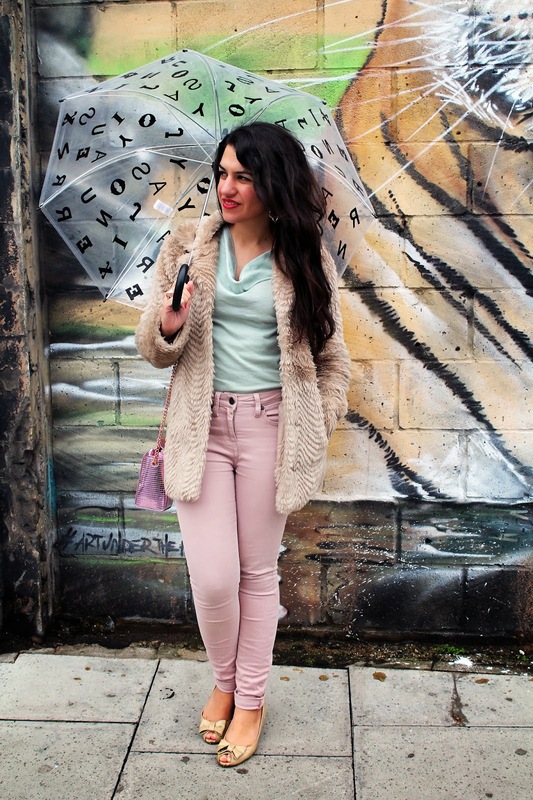 What can I say this colour combo still pushes my buttons – it feels extra good on cold and rainy days too. Well there was just no way I wasn’t going to fall head over heels for this bag. I came across it many months ago on some well-to-do blogger’s Instagram/Twitter feed. I knew it had to be mine and waited patiently for Bershka to launch one of its star autumn/winter ’14 pieces. Just like New Look’s infamous watermelon bag, I must have blinked whilst it sold out. After months of staying alert (although clearly not alert enough), I finally saw it in a window display. Unsurprisingly it was nowhere to be seen in the shop, so when I asked a cute American sales assistant if there were any milk bags left, she over-excitedly told me that it had sold out, like, STRAIGHT AWAY (and that the one in the window was reserved for someone). Unlucky me then did something that I hate doing but that has to be done every now and again – I asked my mum (who lives in Spain, Bershka’s original hood) to have a look around for it just in case. Well, I have the best mum in the world. She found it and made me one very happy lady. Funnily enough she wasn’t that phased about the fact that it looked like a milk carton. 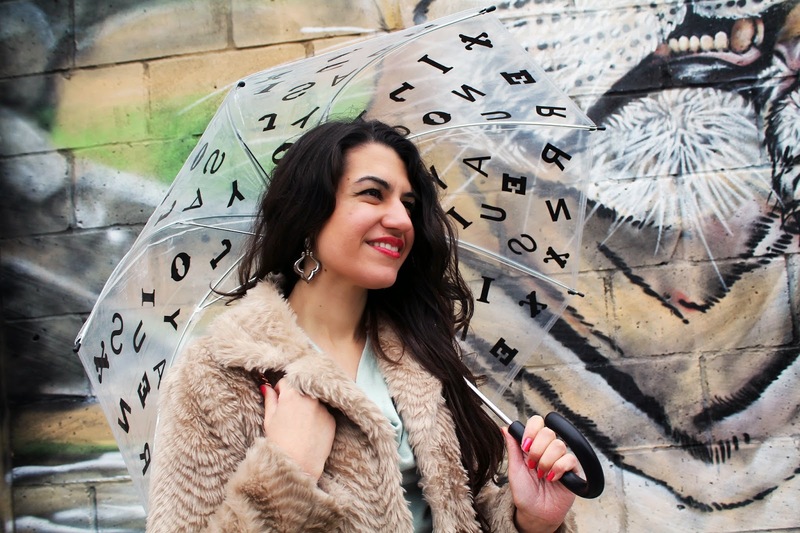 I bought the umbrella a few months ago – I can’t say I really needed it as such (as my plain see-through umbrella is still going strong), but hell, it’s made rainy days a little cuter and I’m grateful for that. I also have a little introduction to make – this beauty came into my life on my Birthday three months ago, and I couldn’t be happier. 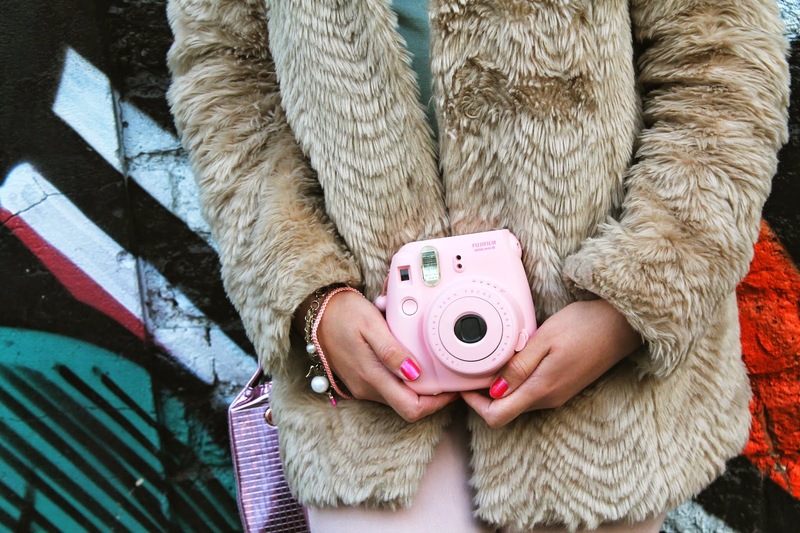 I’ve wanted a Polaroid all my life, and this Fuji Instax is a dream come true. I love how it combines tradition and high-tech coolness – you get the thrill of having a printed photograph straight away but only get one shot, what a beautiful risk! 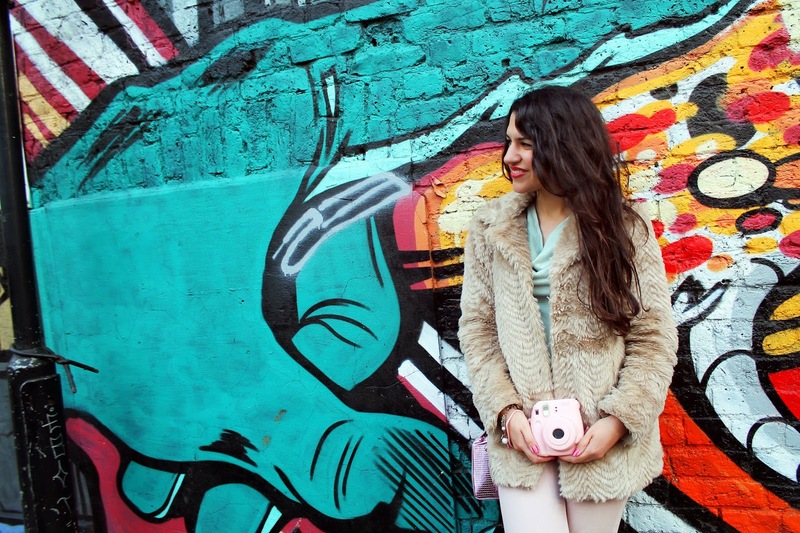 I bizarrely happen to look quite good in the Polaroid wannabes – and it’s pink. I can’t ask for more – it’s one hell of a prop. 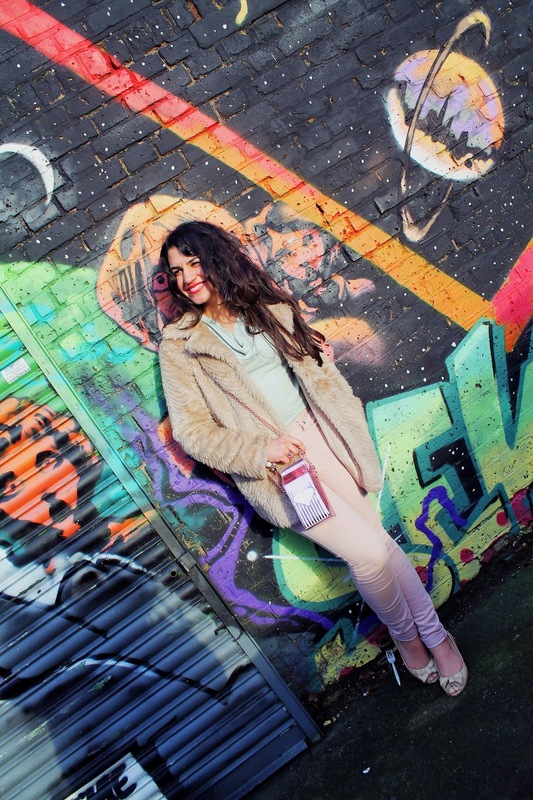 The only thing about such sugar-coated outfits is that one needs a strong background for the picture not to look too drab – I was once again spoilt for choice in Hoxton. 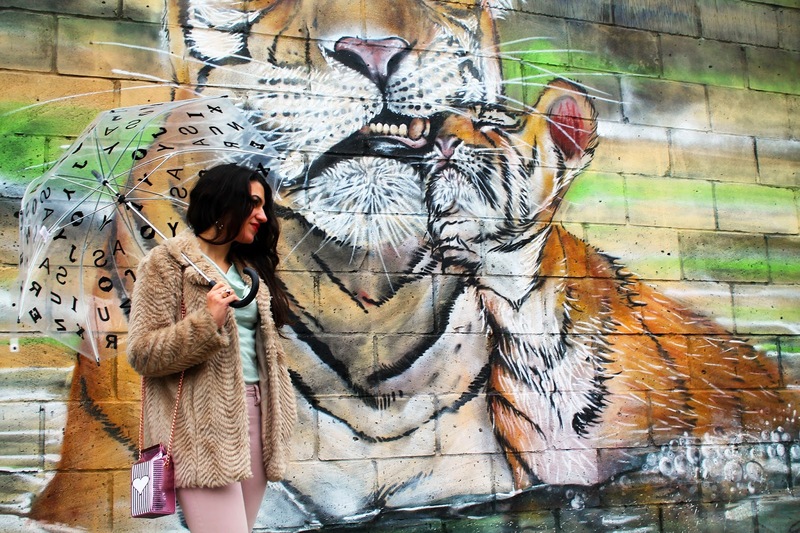 I absolutely love the space images (even though my spaced-out face in the first photograph isn’t quite cool enough for it) and felt like my outfit sort of matched Amara Por Dios‘ pink and mint lady, but my favourite is probably the beautiful tiger cub with its mummy. Seriously, that should be in a museum! 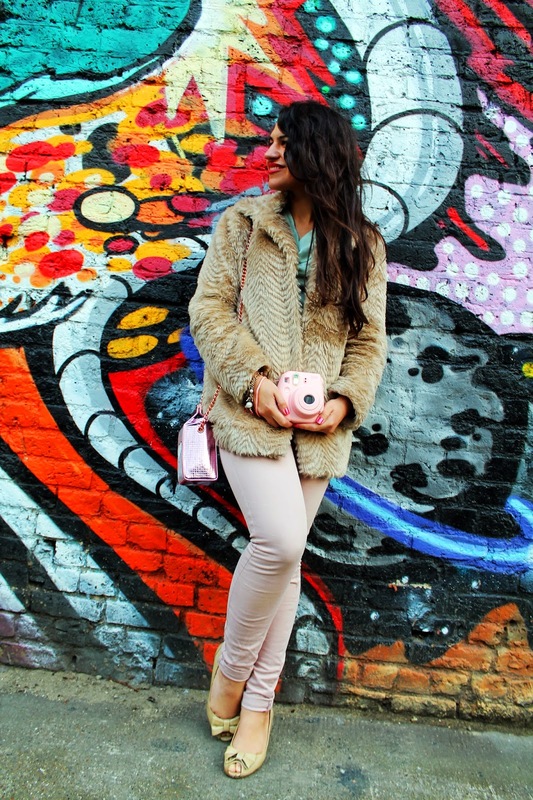 Photographed around Hoxton on November 2nd, 2014 – pictures by Ruth.